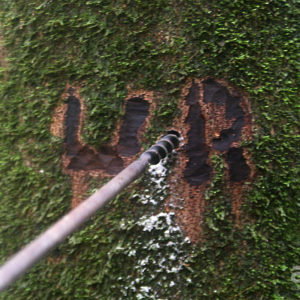 Urbano successfully taps a copaiba tree for its medicinal resin. Urbano lives in the Matsés village of Buenas Lomas Antigua with his wife and two children. Urbano is fiercely independent and lives a very traditional life. He is highly skilled in hunting, fishing, climbing and orienteering himself in the dense jungle. Even among Matsés he is exceptional. 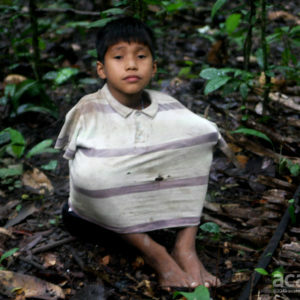 Most of Urbano’s time is spent hunting or on gathering trips in the remote jungle near his home. He prefers to hunt with bow and arrow as shotgun shells are expensive and the noise scares animals away from an area for days. Urbano also uses his bow to shoot fish that feed near the surface of the river. How he sees and hits fish in the dark river water while standing in a tiny, unstable dugout canoe remains a mystery to outsiders. Norton, Urbano’s son, waits and watches patiently as his father attempts to extract resin. 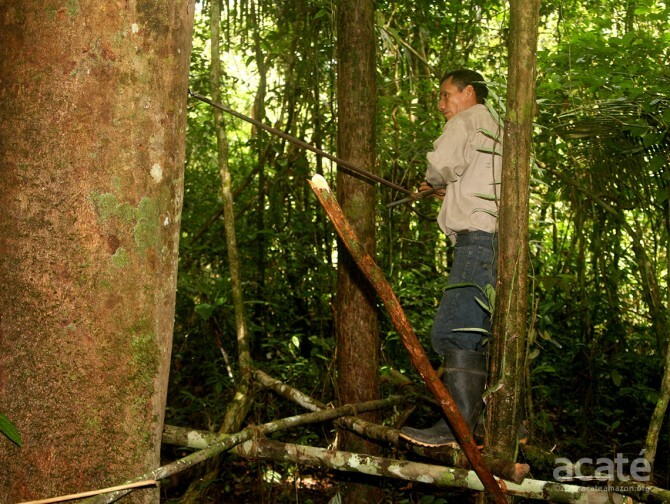 He also deploys deadfall traps and snares to catch smaller animals and birds but most remarkably he actually climbs up into the forest canopy to catch sloths and other slow moving arboreal animals by hand. His climbing ability, using quickly constructed climbing rings, also allows him to collect Kopal resin and many wild fruits, especially Ungurahui. The Kopal resin is applied to bundles of twigs to make torches that emit a warm, bright light; are long burning and have a pleasant smell that also keeps bugs away. 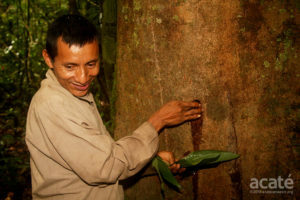 Due to his constant foraging in the jungle, Urbano is very successful in locating copaiba trees for tapping and is a big part of Acaté’s non-timber forest products program. He often takes his family to remote camps away from the river where they enjoy working together hunting and gathering. Urbano is very proud that his son, Norton, is already showing great promise as a future master of the jungle. 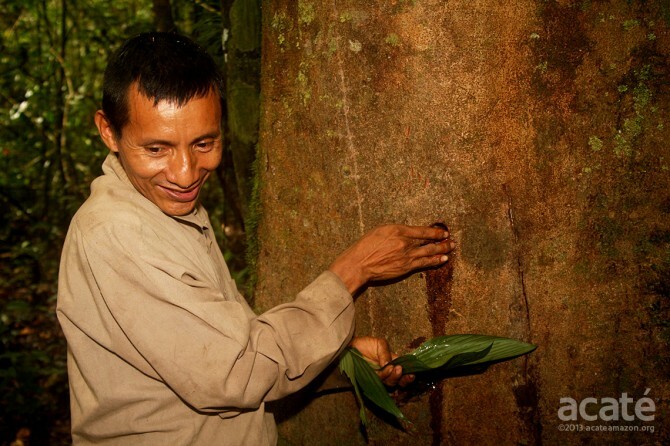 Urbano successfully taps a copaiba tree for its medicinal resin as part of Acaté’s Renewable Resins program that brings much needed and sustainable economic opportunities to the communities.